It is the feeling. It’s the feeling of comfort and affection. As we’re coming back together after a long time, it’s this feeling that convinces me we have succeeded: we are a family. The elderly residents of the Hebrew Home greet me and the young men from Children’s Village with hugs and kisses and questions and laughter. After that we’re right back into our circle, telling stories and listening gratefully to every voice. I am the foliage of the Fall. I want everyone to take a leaf to remember me by. I am sorry that I took so long to forgive you. I am sorry for not listening to you when you talk. I am sorry for getting mad at you and not talking to you anymore. I am sorry for saying things to you in such a tone of voice but you helped me to see that I have a lot of your hurt and you have mine. I am sorry I cannot be the daughter that you deserve and need me to be. I am sorry I can’t always be there when you need me to be. I am sorry I couldn’t make payments for perpetual care on your grave. I am sorry for not following directions the first time. I am sorry for eating the last ox tail. I am a lion with everyone looking up to me. I am a blue fire breathing dragon that protects other dragons. Today was our Special Activity Day for the LitClub girls in Pakistan. We had a guest speaker, Mrs. Parvez, come to speak to the class. She told the girls her personal story of her struggle to get a high school education. Eighteen years ago when Mrs. Parvez graduated high school it was very rare for girls to become so highly educated. She was the first in her family of either gender to stay in school so long. She told the girls of how her household duties often conflicted with her desire to stay in school. She spoke of how she would often wake up hours before school started to do her chores in order for her parents to allow her to attend school for the day. As her parents were uneducated themselves they saw no value in the education of their daughter. Mrs. Parvez was a very determined girl, however, and saw how all the most respected and admired people in her life were educated. She knew education held value. She told the girls how despite the greater number of discouraging influences in her struggle, there were also voices of encouragement. Her teachers encouraged her to learn and to go further; to believe in herself. Mrs. Parvez explained how her story goes beyond her years in school. After marriage she became a teacher and a mother. She was driven to become the voice of encouragement for her students and children. As they succeeded in school she shared in their triumph. Many of Mrs. Parvez’s students have surpassed her in their level of education. Mrs. Parvez went on to say that it wasn’t the talent or family wealth that most decided the outcome for her student but their personal determination. Her son is currently studying for his college degree and she couldn’t be prouder of how he developed a love of learning from her. After her speech she thanked the girls for coming and listening to her story. Mrs. Parvez took refreshments with the girls and answered their questions about her struggles. Our guest speaker joined Ms. Aneela, Mr. Ishraq and I in giving out gifts of notebooks and pencils from Seeds of Hope Foundation to all the girls to aid them in their studies. Hello from Bungoma, Kenya! This week, on the heels of the International Day of the Girl, we used our LitClub meeting to have an open forum discussion, where every girl had five minutes to write two things that made the month of October difficult and then shared these challenges with a friend. After talking with our partners, we came together to work through our challenges as a group. The most common problems among the girls included booing from boys whenever they stand to answer a question in class; lack of support from their parents especially fathers; and carrying the burden of helping their mothers run their families by doing income generating chores. We helped each other come up with practical solutions to some of these problems. We talked about ignoring the booing boys, taking full charge of our LitClub's income generating egg project, and talking to their parents about the importance of educating a girl. 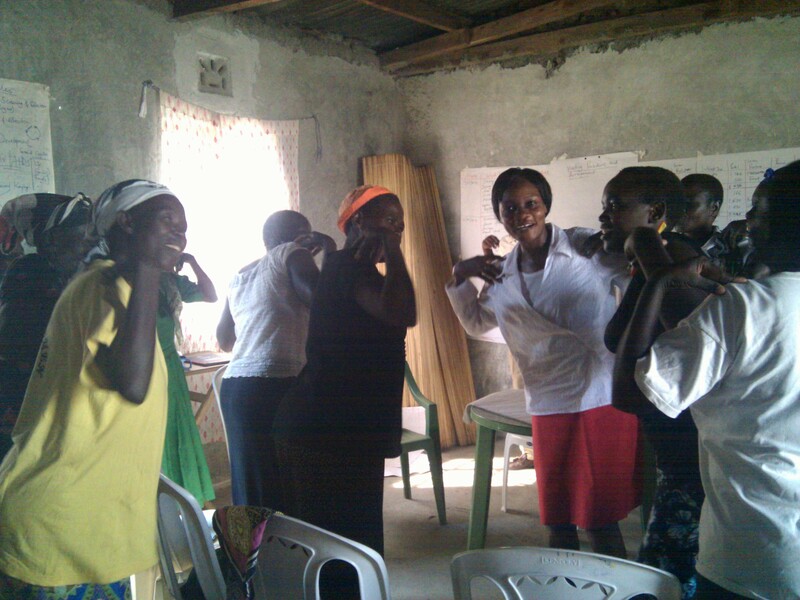 Helping the girls find a solution to the most pressing problems is an accomplishment. I smile when I see them ready to stand up for each other and willing to confront the stumbling blocks to their success in life. the room got parental approval to join! trade those every year to help pay for the next school years required books. especially laugh as a group. Thank you LitWorld for your support in helping Seeds of Hope Foundation encourage these girls through the power of story. 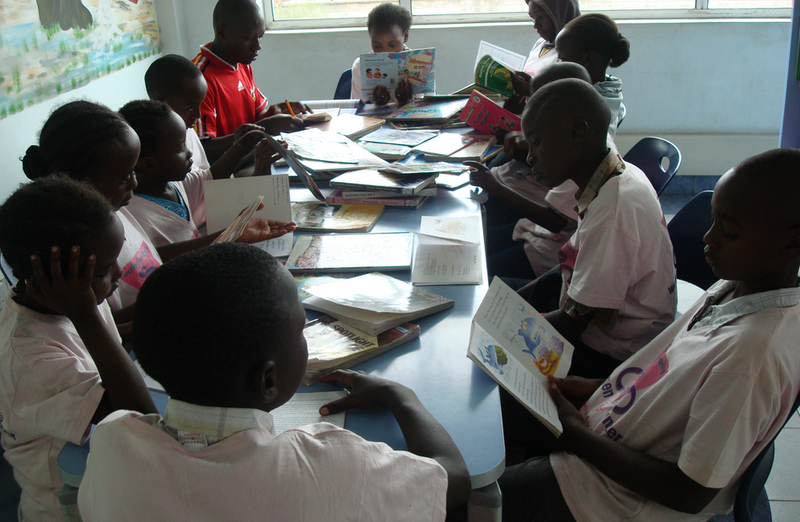 On July 13th, the Girls and Boys LitClubs of Ziwani, Kenya took a field trip to visith the Kenya National Library in Buruburu. On the way to Buruburu, our van was filled with laughter and all of the children were happy and joyful. Some shared stories while others enjoyed the scenery outside, and delighted in counting the number of cars our van overtook. We arrived at the library in good time and the kids moods soared with anticipation as many of them had never been to a full-fledged academic library before. 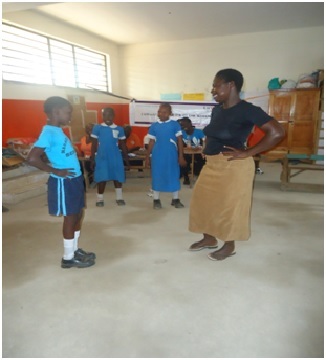 We were received by the librarian on duty and then LitClub leader and experienced librarian, Lesley Koyi, toured LitClubs around the various departments and answered the children's questions. The kids were shown both the adult section and children’s section and asked for time to sit down to read some of the books. After a delicious lunch prepared by Angelina, the Director of the Single Mothers Association (the organization that hosts and runs the LitClub program in Ziwani), the day came to a close. The library management was impressed with the LitClubs and invited them to return to enjoy future activities and events. This week we had a very different and interesting LitClub session. 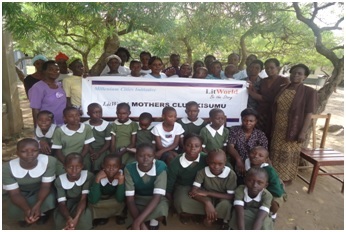 The LitClub members called in their mothers to experience the LitWorld Club. The little girls' mothers came to the Golden Girls Foundation Women's Empowerment Centre from far and wide. We started our LitClub session as usual and taught the moms the "Hello Song" and how to play the name game. Then we broke into groups to tell stories together. It was very interesting to realize that some of the women shared similar life experiences. We asked each group to write down their experiences and then we created a web, drawing lines to connect our commonalities. Next it was time for a big game! 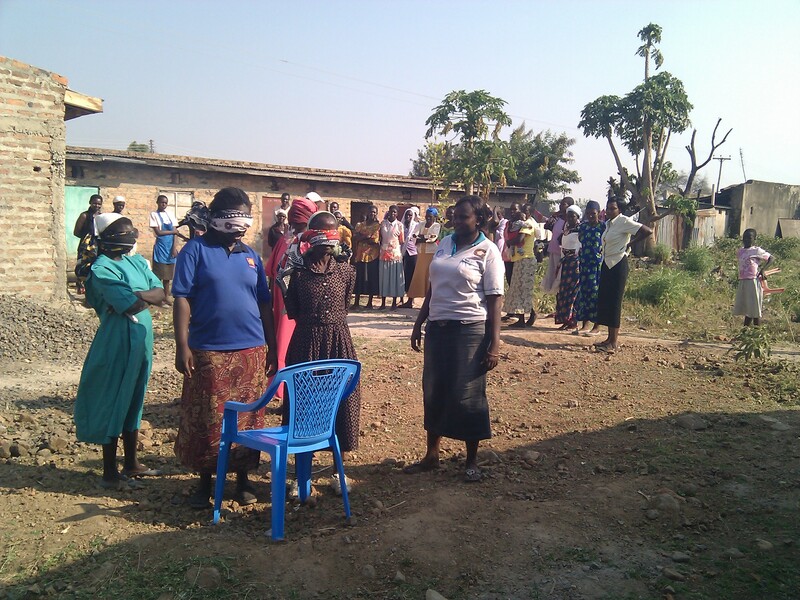 We blindfolded some of the mothers and challenged them to reach a chair that was placed at a distance, some could reach and some could not. This demonstration was used to illustrate that it is important for the mothers who did not get an opportunity to read and write to encourage their children to grasp the opportunity to learn. We finished the day by reading aloud to each other. It was a very lovely day and the mothers were also very happy to learn and experience the activities that their daughters learn through the LitWorld Program. We hope to launch an official Moms LitClub soon! 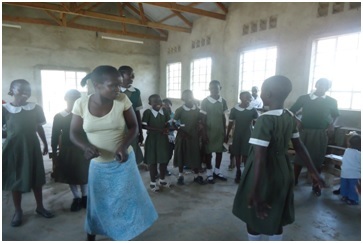 The Kisumu Girls LitClubs started the month of June with a trip to Kisumu Girls high school. By the time we arrived there was a lot of excitement amongst the girls. For the most of the eighty LitClub members on the trip, it was their first time visiting a high school. In other exciting news, Moms LitClubs launched at two programming sites, the Magadi and Nanga Hubs. It was such a joy to know that the LitClub mothers were waiting in anticipation because they had heard of LitWorld, and though they didn't know exactly what it was all about, they wanted to be part of the work that brings their daughters so much joy. During our first meeting, there was a question and answer session with the LitClub Leaders and Regional Coordinator. Then we made a circle and sang songs while mothers and daughters took turns meeting in the center of the circle for a dance off! The girls were so surprised that their mothers would actually have a dance competition with them. The Coordinator encouraged moms to spend more time with their girls because this goes a long way to creating and nurturing a bond that will strengthen during their teenage years, and last for years to come. There was a lot of laughter as jokes were cracked and the girls socialized with their mothers and with each other. 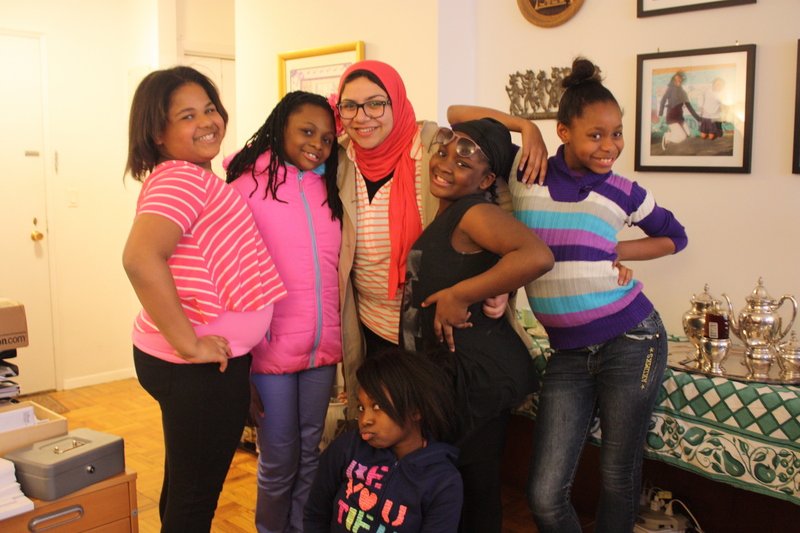 It was another great week for The Golden Girls Foundation Girls LitClub. We had a week of mentoring sessions with the girls wherein the girls shared stories of how they meet their day to day challenges to come to school. Some of them talked of the long distance they have to cover, the rough terrains and sometimes the challenges that Mother Nature poses with the weather. Currently, it is the rainy season and the girls are juggling between waking up early, helping in the field with planting, and then running to school while wading through the puddles of water to ensure that they reach school on time. However they told their stories in such an amusing, lighthearted way, that they ended up cracking our ribs with laughter. At the end of it all we were in high spirits. All these challenges having been shared with other girls instilled the spirit of sisterhood and belonging among the girls. During their spring break, the Polo Grounds Girls LitClub traveled down from Harlem for a special tea party dressed in their nicest outfits. With Dorothy and Brooke’s help, we prepared a comprehensive spread. (Yes, there were cucumber sandwiches.) Hadeer Maher, Pam Allyn’s mentee from the George W. Bush Presidential Center Women's Initiative, joined us that afternoon. 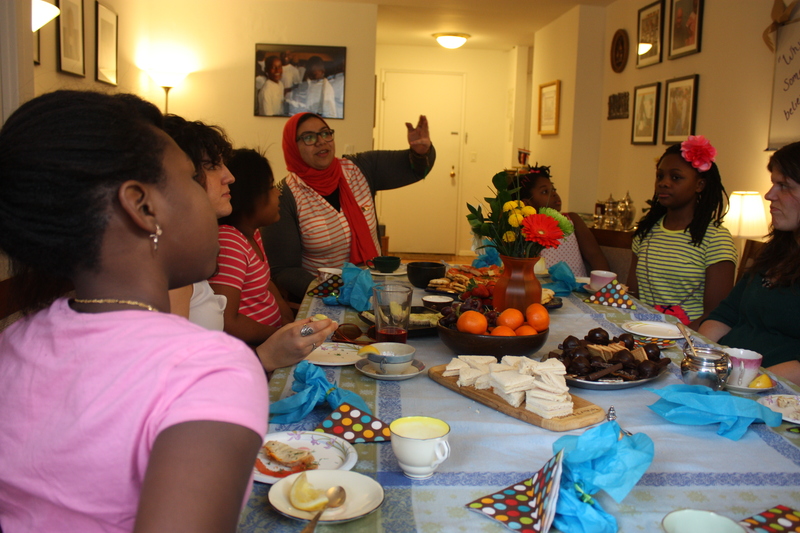 As we ate finger foods, Hadeer helped all of the girls translate their birthdays into Arabic. Sticking their pinkies out while sipping tea, some girls affected their voices to resemble British accents: “May I have a spot of tea, please?” and “Oh, that sounds simply splendid!” Like in our weekly meetings, we took time to read from R.J. Palacio’s Wonder. Still nibbling on snacks, the girls listened while scanning the LitWorld office. For all of the girls, it was their first time seeing the space. "Hi my name is Dasira and I go to LitClub at the Polo Grounds. LitClub is so fun I really love the trips and I feel so comfortable being in girls club because they give us these notebooks and when I write my feelings I feel happy because the LitWorld staff read it. I LOVE GIRLS CLUB AND LITWORLD!!!!!!!" We are the LitWorld committee at East Side Middle School. For the past two years, we have been building friendships with students who attend the Red Rose School in Kibera, Kenya. Kibera is the largest slum in East Africa and the students live in horrible conditions. However, you cannot tell that they suffer a lot, because they have never complained. Our friends are kind, caring, and relatable. They have opened our eyes and made us rethink many things we take for granted. Our problems seem miniscule compared to theirs. But they have made one thing clear, they don’t want anyone’s pity. Our friends want to be treated just like everyone else. Unfortunately, in Kibera, high school is not free. It costs $500-1500 per child per year. The issue is that many families do not have the money to send their children to high school. If children don’t go to high school, they will have to get a job to support their families or they will have to get married to support themselves. So far we have raised $2,300 and with the help of Litworld’s already existing grant, we have all managed to send all the eighth graders who attend the Red Rose School to high school for one year. We are beginning to write letters to political leaders in the U.S. to help spread awareness about this issue of not being able to continue their education. Education is a very important thing, it is a right and everyone should be able to get one. 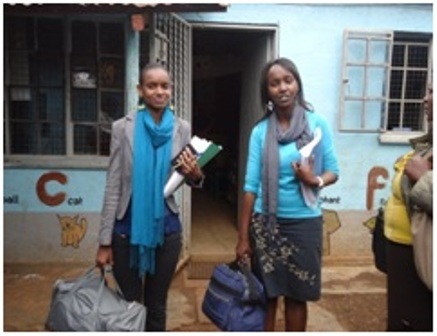 Here are three brilliant grade 8 graduates in Kibera. Oh the stories they will tell. 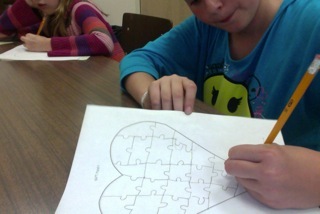 "This past week in LitClub, we completed a heart maps with the 4th and 5th grade girls. Typically, you fill a heart map with your roles in the world, however, this time we wrote down roles we hope to have in the future. For example, I put that I want to be a graduate school degree holder. (Is there a simpler way to say this?) During this session, I sat next to a girl named Christen, an intelligent and incisive member, who can get squirmy during the longer stretches of LitClub and her restlessness can sometimes verge on disruption. After completing our heart maps, Christen and I shared the roles we hope to inhabit in the future. Among other things, she wants to be a gymnast, and a recipient of good grades. I explained to her that since my grandmother had recently fallen ill and entered the hospital, I want to be a granddaughter. Immediately, she sympathized with furrowed eyebrows and a slight frown. “I’m sorry about your grandma,” she told me as she reached over for a hug. “I hope she gets better.” Having someone who is often silly and jocular express such genuine, heartfelt support held such meaning."